Garuda Indonesia is reducing capacity across its medium and long-haul networks as the airline group increases its focus on the domestic market. Garuda has now made multiple adjustments to its international expansion plan, which has proven to be overly ambitious. Capacity to Australia and Japan, Garuda’s two largest international markets after Singapore, is being cut as part of a restructuring of its unprofitable international operations. The cuts are a sensible response to overcapacity and intensifying competition but leave an opening for competitors, particularly long-haul low-cost start-up Indonesia AirAsia X.
Garuda will likely allocate almost all of its additional capacity in 2015 to the domestic market. The domestic expansion is partly strategic as Garuda responds to the rapid expansion of Lion Group full service subsidiary Batik Air. Garuda on 13-Jan-2015 announced several changes to its short-term network and fleet deployment strategy in response to challenging market conditions. The network changes include the suspension of services to Brisbane from 1-Feb-2015, shelving plans to launch Nagoya and the reduction of frequencies to Tokyo. Garuda also stated that it plans to make as yet unspecified adjustments to other destinations in Australia as well as to Europe. Meanwhile the group is adjusting its fleet plan by negotiating early returns for several aircraft and pursuing subleases. Garuda is also reconfiguring its 737-800s to boost seat counts, which will improve efficiency and result in an increase to capacity on some domestic and short-haul international routes. The biggest adjustments are to Garuda’s medium and long-haul operation, which has been highly unprofitable since the airline started pursuing ambitious expansion in 2013. Garuda during 2014 already made several adjustments to its international expansion plan in response to a dismal performance on international routes in 1H2014. In mid-2014 Garuda decided to shelve plans to launch Manila and Mumbai and cut services to Taipei in favour of a new codeshare with fellow SkyTeam member China Airlines. Earlier in 2014 Garuda also adjusted its launch plans for London Gatwick from non-stop to one-stop via Amsterdam. London, Manila and Mumbai were initially the three new international destinations identified in Garuda’s business plan for 2014 with all three routes earmarked for non-stop flights from Jakarta. Garuda’s international performance improved in 2H2014 as a result of the initial adjustments. But the medium/long-haul international operation has continued to be unprofitable with unsustainably low load factors and yields. Garuda’s average international load factor was only 66% through the first 11 months of 2014. 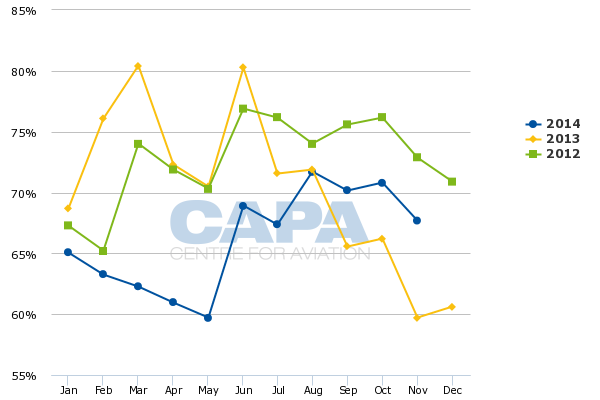 After an average load factor of 64% through the first seven months of the year the load factor was again slightly above the 70% mark in August, September and October as ASK levels were reduced. But it dipped to 68% in November. Garuda was initially planning to add back international capacity in 2015 while resuming some international expansion - although a much more modest rate of expansion was planned compared to 2013 and 1H2014, when international ASKs surged by 14% and 15% respectively. As CAPA outlined in Dec-2014, the previous business plan for 2015 included additional capacity to Japan, Saudi Arabia and China. Garuda was also planning to slightly expand capacity to Europe by upgrading from Jul-2015 its Jakarta-Amsterdam-London service from five weekly flights to daily. The Japan and Europe increases have been scrapped with Garuda instead pursuing reductions to Japan and potentially Europe. China and Saudi Arabia are still growing but modestly. The China growth is limited to newly launched low frequency charter flights to secondary Chinese destinations. The 13-Jan-2015 launch of three weekly scheduled flights from Bali to Beijing came at the expense of a reduction on Jakarta-Beijing from seven to four weekly frequencies. Earlier versions of the business plan for 2015 had also envisioned the launch of new European destinations as additional 777-300ERs were delivered. Garuda, which took its first 777-300ER in 2013 and now operates six of the type with four more on order, initially had an ambitious European expansion plan that envisioned using the 777-300ER to operate non-stops to France, Germany and Italy as well as the UK. But the plans for France, Germany and Italy were all set aside as London was deferred and changed from non-stop to one-stop. Garuda has now postponed plans to upgrade its only European route, Jakarta-Amsterdam-London to daily. Garuda suggested in its 13-Jan-2015 announcement that more adjustments to its European schedule are forthcoming without providing details. Garuda could potentially cut its London service entirely. As CAPA has suggested previously, relying on connections with partner KLM to serve the London and UK market would be logical - if not optimal - given KLM’s strong UK network and the relatively high cost of operating the Amsterdam-London tag. But pulling out of London would be a bitter pill to swallow. Garuda has invested significantly in the UK market, setting up an office in London and building up its brand through sponsorship of the Liverpool Football Club. Garuda's image already suffered from a PR standpoint by twice postponing the London launch (both times after ticket sales had already begun) and dropping the initial plan for non-stops. Garuda also initially looked at serving New York via London. Indonesian authorities negotiated New York-London rights at Garuda's request but the route was contingent on Indonesia being upgraded by the US FAA to Category 1, which has still not happened. Garuda’s Jakarta-Amsterdam service is now the only non-stop route connecting Indonesia and Europe. The route can be sustained – and potentially upgraded to daily – by offering connections throughout Europe and to the Americas via KLM. But other European destinations are not viable at this point. Garuda’s initial plans for Europe were always overly ambitious. Garuda will be better off focusing on its core strength, the domestic and regional international market, and relying primarily on partners to build up its network in other regions. Australia and Japan are more strategically important markets for Garuda as they are within the Asia-Pacific region. Australia and Japan are Garuda’s second and third largest international markets. 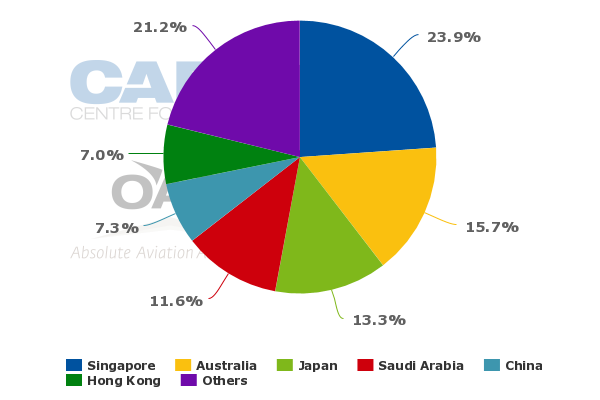 Australia currently accounts for about 16% of Garuda’s international seats and 17% of ASKs while Japan accounts for about 13% of seats and 19% of ASKs. Only Singapore is a larger market based on seats and only Saudi Arabia is a larger market based on ASKs. But Garuda expansion in Australia and Japan over the last two years has been overambitious, particularly as it has come at a time competition has intensified and the weakening AUD and JPY have hurt outbound yields from those countries. Garuda increased capacity between Indonesia and Japan by over 80% from Nov-2011 to Nov-2014, driven primarily by the launch of flights to Tokyo Haneda from both Jakarta and Bali and the up-gauging of some existing Japan flights from A330s to 777s. Garuda was initially planning further expansion in Japan for late Mar-2015 with the launch of five weekly A330-200 flights from Jakarta to Nagoya, which would have become its fourth Japanese destination after Haneda, Tokyo Narita and Osaka. Garuda has now dropped plans for Nagoya, which it had been selling since Oct-2014. Garuda is also cutting flights to Tokyo, where Garuda has doubled capacity over the last three years. The Tokyo market was being served in late 2014 with four daily flights. Current schedules indicate Garuda will not operate Bali-Haneda from 15-Jan-2015 until at least the end of Mar-2015. Bali-Haneda was initially launched in Apr-2012 with five weekly flights and was subsequently upgraded to daily. Garuda will continue to operate daily services from Bali to Tokyo Narita. Current schedules also indicate that Jakarta-Narita has been dropped until at least Mar-2015. Garuda had been serving Jakarta-Narita and Jakarta-Haneda daily. Jakarta-Haneda, which was resumed in Jun-2014, will continue to be served daily. Osaka services at least for now remain unchanged with daily services from Bali and four weekly flights from Jakarta. The adjustments in the Indonesia-Japan market are sensible as the capacity added by Garuda and other carriers in recent years was not sustainable. Garuda codeshare partner All Nippon Airways (ANA) launched services on the Jakarta-Haneda route in late Mar-2014, doubling its capacity to Indonesia as the Japanese carrier maintained its daily Jakarta-Narita service. JAL has also increased capacity to Indonesia over the last two years and now serves the Jakarta-Narita route with two daily flights. But the reduction in the Japanese market by Garuda leaves an opening for long-haul low-cost start-up Indonesia AirAsia X (IAAX), with its much lower cost base. IAAX has applied for authority to serve Japan from its Bali base. Slots at Haneda, which AirAsia X already serves from Kuala Lumpur, could potentially open up if Garuda does not reinstate its Bali-Haneda service. Osaka and Narita, which the AirAsia X Group currently serves from Kuala Lumpur and Bangkok, are also possibilities. While Garuda competes with Japanese carriers on the more business focused Jakarta-Japan market it currently is the only carrier offering non-stop services in the Bali-Japan market. As this is almost entirely a leisure market IAAX could emerge as formidable competitor, stimulating growth as well as likely taking market share away from Garuda, which could struggle to compete given its higher cost structure. New low-cost competition also impacted Garuda’s performance in Brisbane. Garuda launched services from Bali to Brisbane in 2013 with daily 737-800 service as part of a push in Australia that also included the launch of services from Jakarta to Perth. But competition in the Bali-Brisbane market intensified significantly in Apr-2014 as Jetstar Airways launched four weekly flights using its new fleet of 787s. Virgin Australia also currently serves the route with 10 weekly 737-800 frequencies. Garuda will operate its last flight to Brisbane on 1-Feb-2015. The airline for now continues to link Bali with Melbourne and Sydney with daily flights although it has said more schedule adjustments for the Australia market are forthcoming. OAG schedules indicate that Garuda will start combining some of its Bali-Melbourne and Bali-Sydney services from mid-Feb-2015 with certain frequencies stopping in both Australian gateways. Garuda also serves Melbourne and Sydney from Jakarta with five weekly flights on each route. Perth is served daily from Bali and five weekly flights from Jakarta. All of Garuda’s Australia routes operate with A330s except Jakarta-Perth and Bali-Brisbane, which is operated with 737-800s. Garuda at one point planned to introduce 777-300ERs on some Australia flights but this was scrapped as it recognised the market was already oversupplied. 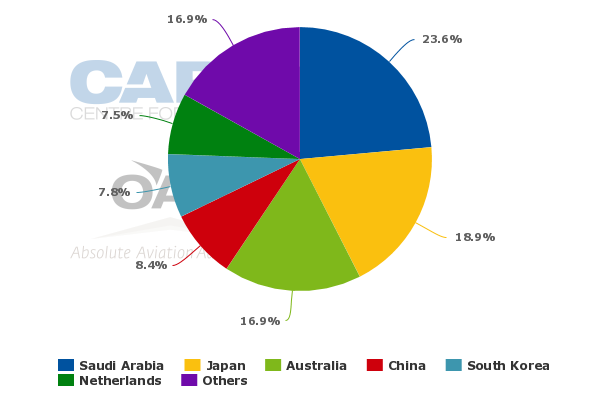 As is the case with the Japan market, Garuda’s reduction in Australia provides a potential opening for IAAX. The new AirAsia X affiliate is planning to link Bali with both Melbourne and Sydney and also has been considering Brisbane. IAAX initially planned to begin operating five weekly flights on Bali-Melbourne on 26-Dec-2014 but had to postpone the launch pending approvals from Australian authorities. The capacity reductions in the Australia and Japan markets have resulted in adjustments to Garuda’s fleet plan. Garuda initially was planning to take delivery of 19 aircraft in 2015 while disposing of only one aircraft. In its 13-Jan-2015 restructuring announcement Garuda stated it now plans to take delivery in 2015 of 15 aircraft and return “several” aircraft earlier than initially contracted. Garuda also stated it plans to sublease an unspecified number of aircraft. Garuda did not indicate which aircraft types will be reduced as part of its forthcoming fleet restructuring. But an adjustment in the widebody fleet would be logical as the airline is now planning to cut rather than grow medium/long-haul capacity. Garuda is slated to take two additional A330s and three additional 777-300ERs in 2015, giving it a fleet of 24 A330s and nine 777s. Garuda potentially does not need any of these aircraft given the new international capacity and network adjustments. CAPA has previously highlighted that Garuda has surplus 777s. The flag carrier initially committed to 10 777-300s to support its expansion plan for Europe, which initially envisioned four to five non-stop routes. But Garuda now only intends to operate one route to Europe on a less than daily basis. Garuda has been using the 777-300ERs for Japan but the A330s are generally a better fit for the Indonesia-Japan market given current market conditions. Garuda had been planning to use the three additional 777-300ERs that are slated to be delivered in 2015 for the Saudi Arabia market. The 777s will partially replace ageing 747-400s while also giving Garuda an opportunity to increase frequencies to Jeddah. But as Indonesia-Saudi Arabia is primarily a migrant worker and religious market it is also better suited for A330s because the 777-300ERs have a larger premium cabin including Garuda’s only first class product. Garuda would be wise to explore opportunities to sublease some of its 777-300ERs, which unlike some other aircraft types, is in relatively high demand. Garuda has more options with its A330s as they can also be used on some domestic trunk routes and some short-haul international flights such as Jakarta-Singapore. Garuda could end up with excess 737-800s as the type was used for Bali-Brisbane but it continues to have opportunities to expand in the domestic market. Garuda also is committed to taking additional CRJ1000s and ATR 72s in 2015. But these aircraft are being used to expand into new regional routes, an important component of the group’s strategy aimed at further strengthening its domestic position. Through the first 10 months of 2014 Garuda mainline domestic ASKs were up 17% while Citilink ASKs increased by 30%. Garuda was already planning to again pursue double digit mainline domestic capacity growth in 2015. Domestic growth could be further accelerated given the adjustments in international capacity – even with the adjustments to the fleet plan. Some of the domestic capacity growth will be generated as Garuda reconfigures its 737-800s, which is the backbone of Garuda’s fleet as it accounts for 75 aircraft of the 132 aircraft in service. Garuda’s 737-800s now have three business class rows in two-by-two configuration for a total of 12 seats. Garuda plans to reduce the business class cabin to only two rows or eight seats, noting that its average business class load factor has been only 40% to 50%. The group has not said how many extra economy seats will be added but stated in the restructuring announcement that total seat capacity on its 737-800s will increase by up to 15% to 20%. As Garuda currently configures its 737-800s with 156 seats, a 15% to 20% increase in seat count would result in a configuration of between 180 and 187 seats. To achieve this would require a reduction in seat pitch along with the elimination of one business class row. Garuda also plans to boost labour productivity as the airline is not planning to add staff as it expands its fleet in 2015. Garuda has stated that its aircraft per employee ratio will be reduced from 1:60 currently to 1:50 by the end of the year. Over the last several years Garuda has already significantly reduced its employee per aircraft ratio as it expanded its fleet without adding administrative staff. Garuda needs to continue pursuing cost cutting initiatives in order to stay competitive in the dynamic Indonesian marketplace. Adopting some elements of the LCC model while maintaining product standards is a sensible response – and one that new Garuda CEO Arif Wibowo is particularly adept to pursue as he was previously the CEO of low cost subsidiary Citilink. Garuda will have its challenges in 2015 as competition in the Indonesian market intensifies further. But Garuda should benefit from lower fuel prices and its new more rational approach to international capacity. The adjustments in the international market, where Garuda competes more against Indonesia AirAsia and foreign carriers as Lion is still a tiny international player, will enable Garuda to increase its focus on the more important domestic market. As Garuda engages in a strategically crucial battle with archrival Lion at both the top and bottom ends of the domestic market it cannot afford the distraction of an unprofitable international operation.